Forgive me guys, this is going to be a shortish post! I am super busy this week with office work and so many side projects plus trying to keep myself sane and making time for yoga and relaxation at the same time is quite a challenge. So what’s keeping me so busy? I am not going to spill the beans just yet but behind the scenes of When Sweet Becomes Healthy are some really cool projects developing, so stay tuned! But you know what? 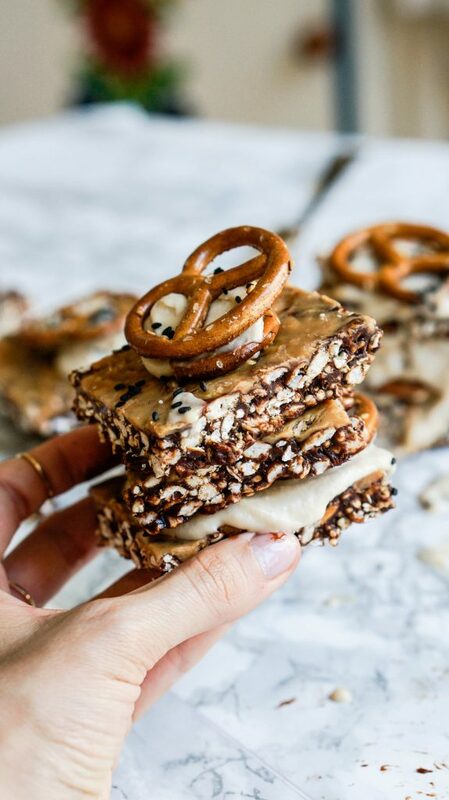 There is still time to share these Peanut Butter Pretzel Pop Bars with Maca Cream with you. 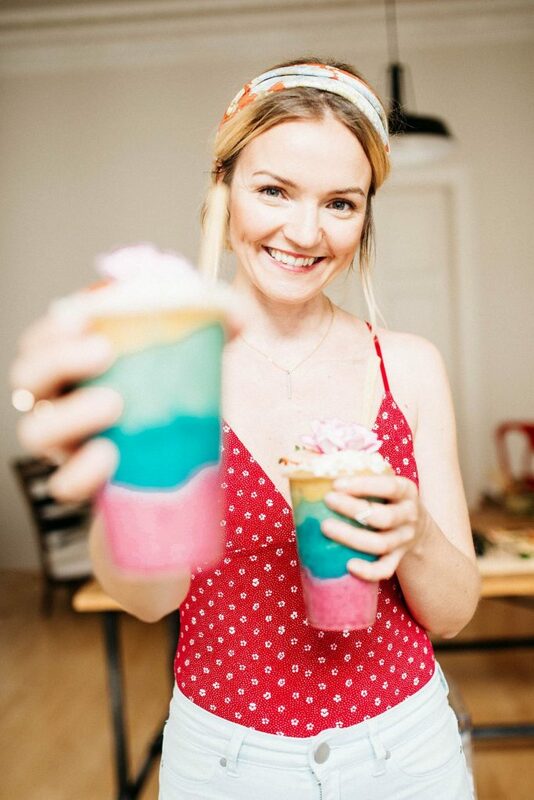 But as you know no matter how busy I am, there is always time in the kitchen to do what I love the most which is creating healthy and yummy treats for you guys! In fact, it gives me room to be super creative, charge my batteries and feel thankful for those simple things like baking. But apart from relaxing my head, these Peanut Butter Pretzel Pop Bars with Maca Cream came about! They are a brilliant summer snack as they are light, crispy and so satisfying and flavorful. But at the same time there are rich, chocolatey and creamy. They are also glutenfree and vegan. It’s a super easy no-bake recipe that comes together in one bowl. The recipe below makes a whole baking tray of treats so feel free to cut the recipe in half if you don’t want as much! I don’t know how you feel but that tray of Peanut Butter Pretzel Pop Bars disappeared pretty quickly from our fridge! I hope you enjoy this recipe. Let me know what you think in the comments! In a big bowl mix the rice pops, pretzels, buckwheat, and vanilla. Melt the dark chocolate on the side and mix with the maple syrup. Add to the dry rice pops mixture and combine until all dry ingredients are coated with chocolate. Spread the mix onto a lined baking tray and transfer to the fridge for an hour so the mixture can set. For the peanut butter maca cream mix the coconut cream with the peanut butter adding the maple syrup while stirring. Whisk in the vanilla paste and maca powder. Assemble your bars by removing the chocolate rice bar mixture from the fridge and cutting the bars into shapes of your liking. Create sandwiches by adding the maca cream between 2 bars. Top each sandwich with a dollop of maca cream and top with a pretzel. Set in the fridge for another 30 minutes and they are ready to enjoy! 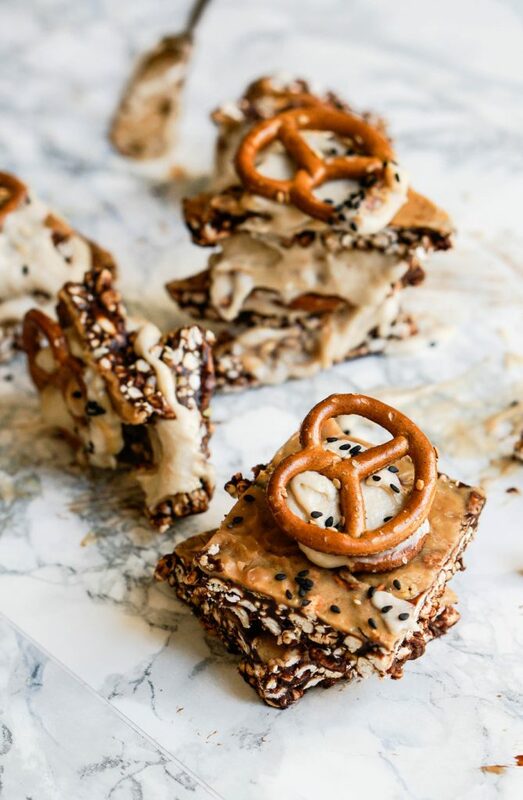 I hope you enjoyed my Peanut Butter Pretzel Pop Bars with Maca Cream! For more wholesome treats try my Salted Caramel Crispy Slice, my Peanut Butter Crunch Bars and my Peanut Butter Fluff Bars!